You have undoubtedly noticed by now that something called GDPR has taken effect (see “Europe’s General Data Protection Regulation Makes Privacy Global,” 2 May 2018). The General Data Protection Regulation is a European Union framework for handling user data. Even if you’re not in Europe, you have been receiving email messages regarding updated privacy policies. Many companies are applying GDPR’s requirements to their entire customer base under the assumption that it’s better and easier to homogenize the way they manage user data, especially if other countries outside the EU adopt a similar approach to data management in the future. Plus it’s good publicity. Apple is no exception to this movement. The company has changed the way it handles user data and the way it informs users about privacy. Because of this, it recently unveiled a new option that lets you download most of the data that is linked to your Apple ID. This feature is currently available to users in the European Union, as well as members of the European Single Market: Iceland, Liechtenstein, Norway, and Switzerland. Apple has said it will roll out this feature worldwide in the coming months. The second option isn’t particularly useful—it just provides links to the Apple ID Web site, where you can correct your name, address, and other data; and to Apple Online Store account settings. The last two options are somewhat self-explanatory: you can deactivate your account temporarily if you wish to take a break from Apple services (perhaps you want to delete your account but want to test the waters first to see if you’ll miss anything), or you can go nuclear and delete your account entirely. The first option, however, is why we’re here. To download your data, click the Get Started link at the end of the “Get a copy of your data” paragraph. 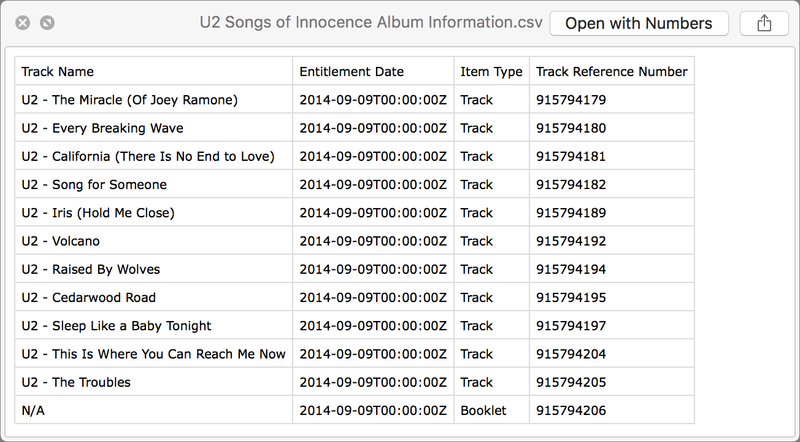 It takes you to a page that explains what you can download and in which formats you’ll receive the data. Apple says this data will be provided “as spreadsheets or files in JSON, CSV, XML, or PDF format.” For many people, this choice will be confusing. Most people know what a PDF is, and many TidBITS readers probably know what a CSV file is, but how many will know what to do with an XML file or have even heard of a JSON file? PDF is the most human-readable of these formats. CSV—comma-separated values—is basically a way of representing the columns and rows of spreadsheet data in a text file. XML and JSON are file formats that present data in a structured format, with tags, suitable for importing into other apps or uploading to Internet services. You can download 15 types of data, as you can see in the screenshot. The page presents a series of categories: check those you want to download or click Select All. The organization of the data is a little odd and seems to be more by size than logic. The items in the top section either reflect your interactions with Apple or let you download small data stores: calendars, reminders, contacts, bookmarks, and notes. The bottom section provides access to larger data stores in iCloud: your files, email, and photos. Although you can export all of the data out of the appropriate apps on your Mac, you may still want to download it if you’re moving away from Apple’s ecosystem and wish to import everything into another platform or service. Apple provides contacts, calendars, bookmarks, and email in (respectively) VCF, ICS, HTML, and EML formats, which are readily imported into other apps. 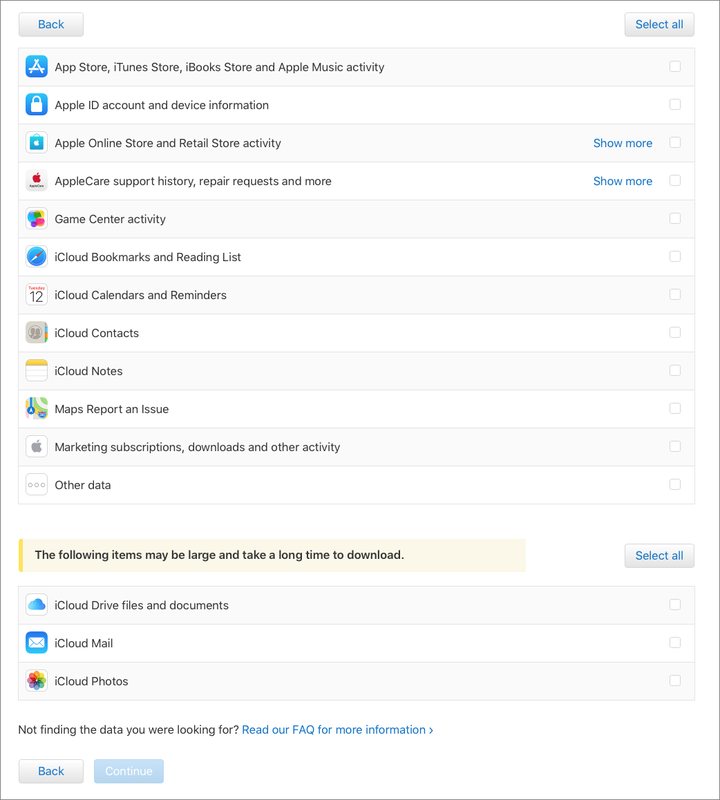 The files, email, and photos in the bottom section are generally much larger downloads if you have a lot of files in your iCloud Drive or a lot of photos. Apple warns that they may take a long time to retrieve. 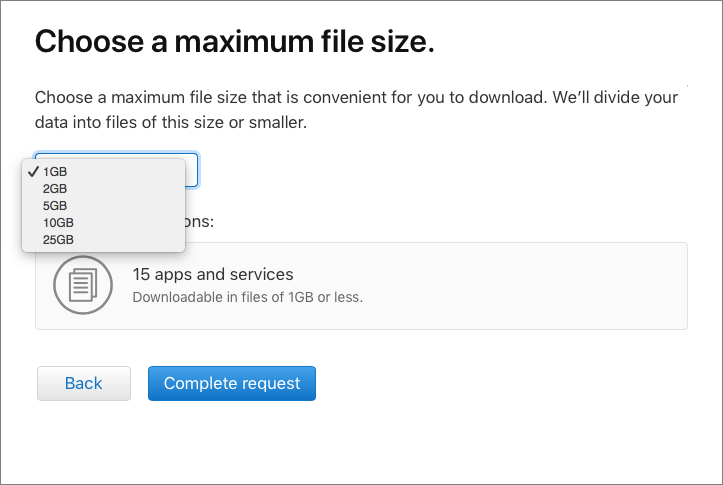 When you’ve made your selection, click Continue, and you’ll be asked to select the maximum size of the files that Apple provides for download. Assuming you’ve only selected the first group of items, the total will probably be less than 1 GB. If you have a lot of photos, on the other hand, it could be hundreds of gigabytes, so choose a file size that’s easy for you to manage and download. If you have a slow Internet connection, specify smaller files, so if the download flakes out mid-file you won’t have to re-download too much data. Apple says that it may take up to seven days to provide this data. For me, it took six days. 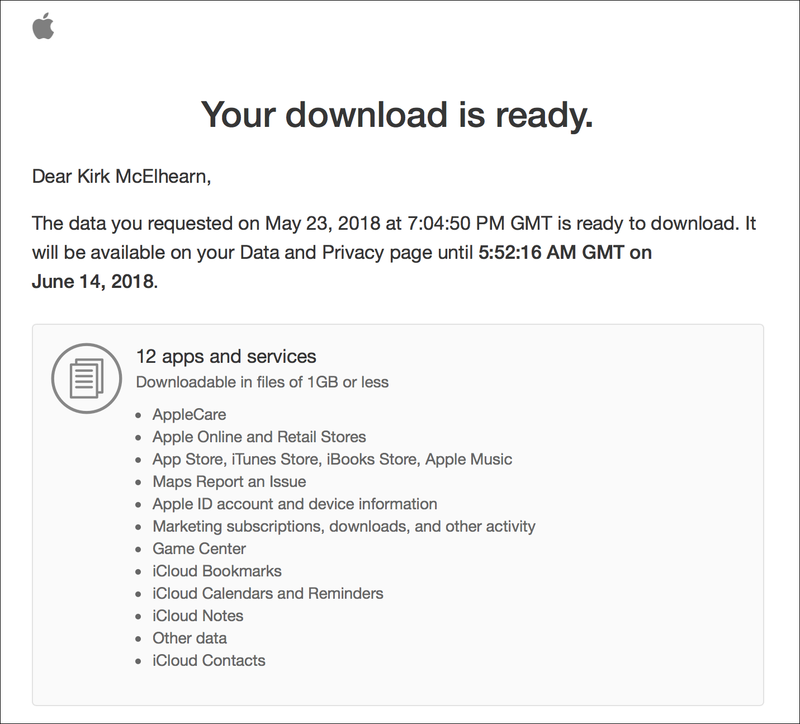 I requested my data on 23 May 2018, and on May 30th, I received an email from Apple telling me that I could download it. I was taken to a Web page where I could download data from these twelve categories. Each category downloads as a Zip archive—a couple of which contained two or three more Zip archives. Most of the data is in CSV format, with a few JSON files. You can view the CSV files in the Finder with Quick Look (click a file and press the Space bar), or you can open them with Excel or Numbers to view them more easily. None of the data is very interesting. It’s a lot of spreadsheets of things you’ve bought from Apple—even updates to iOS apps, your support history (such as repairs, online chats, and screen sharing sessions), information about which devices are signed into your Apple ID, and more. It was interesting to see a list of all the repairs I’ve had to my Apple hardware. It’s worth noting that this is an Apple ID I’ve been using for just the five years that I’ve lived in the UK—but there isn’t much detail. In one file, I see the serial numbers of different devices and dates, but nothing about what type of devices they are or what type of repairs were carried out. The majority of the data is store-related: devices authorised to use the iTunes Store, and apps, music, videos, and ebooks that I’ve purchased. 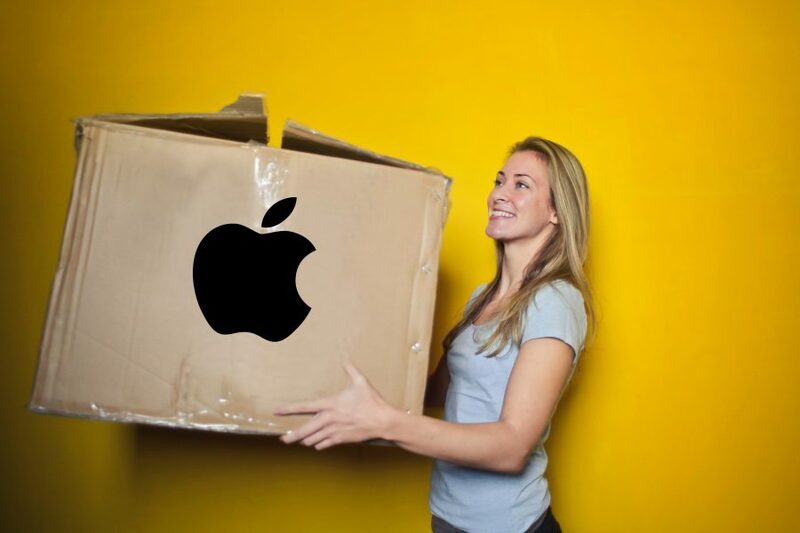 But one thing that is missing is my purchases from the Apple online store: the two Macs I bought last year, my iPhone 8+ and previous iPhones, my Apple Watches, Apple TVs, and more. There is an Online Store Activity folder in the Other Activity folder, but its contents are sparse. It merely contains Ratings and Reviews, Saved Cart, and Shipping Address History. There was one file I didn’t expect to see. 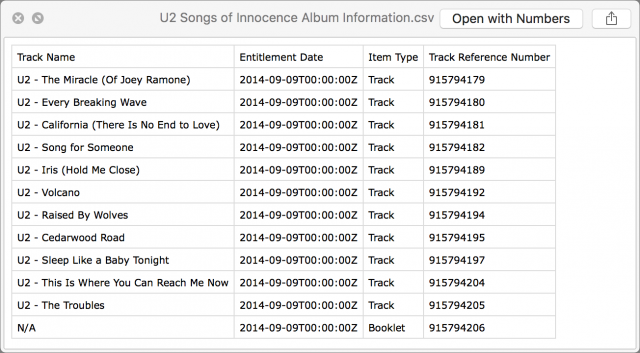 In case you thought you could forget about this, there is a special file about that free U2 album that Apple gave everyone in 2014 (see“How to Get (or Delete) Your Free U2 Album,” 10 September 2014). I don’t know what the file is for, other than as a reminder of that unpleasant incident. It’s a good thing that Apple is providing a relatively simple way to access all this data, although some of the file formats may prove daunting for many users. 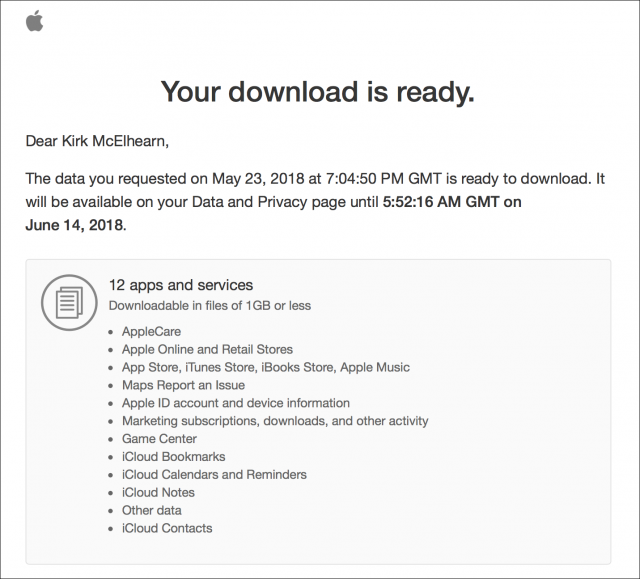 To learn more, read Apple’s support document “Get a copy of the data associated with your Apple ID account,” which includes a FAQ that deals with some of the questions that may arise, such as those concerning file formats, why some data is masked, why dates may seem strange, and more. Many people, like me, will download this data out of curiosity. But this service is more about giving you a way to import your data into other apps or services because part of GDPR is the right to data portability, so you can move your data without losing anything. Think of it as an aid if you decide to leave the Apple ecosystem and want to be able to retain the data you’ve accumulated over time rather than a way of checking up on what data Apple has been storing about you.